← Tee Time: When Jesus makes tea . . .
My grandma is a truly amazing woman of faith, whose life bears witness to the grace and goodness of God. She gave herself to Christ at a young age and has been serving him ever since in central New Jersey—in her home, her church, and her community. She has been one of the most influential people in my spiritual formation, a constant encouragement and a shining example of Christlikeness. Selfless and joyful in all that she does, she lives in constant praise of the One who has saved her. Not only does Mom-Mom model Christ to me, she is also the most talented pianist I know. As with her other gifts, she uses it to serve God; she’s been playing the piano and/or organ for her church for the last sixty-five years, and she gives regular concerts at a local nursing home. Though I too play the piano, I know I will never attain the level of expertise that she’s been able to—but it’s fun to try to work toward! We sometimes tinker around together in duet. But I can really only play the notation in front of me; Mom-Mom, on the other hand, has this amazing ability to embellish a basic melody with all kinds of creative flourish. Her arrangements have an arc that builds to a climax and then winds back down again. Some of my fondest memories of visiting Mom-Mom and Pop-Pop’s have to do with sitting in the living room with the rest of my family, listening to her make those keys sing. We cuddle up in blankets with dessert in hand and shout out hymn requests, which she strings together into seamless medleys full of spiritual vitality. When Mom-Mom visits my parents in North Carolina, she’s usually invited to play special music at their church. During one such practice session last November, my mom arranged to have her recorded. So with no advance notice, nothing special prepared, Mom-Mom sat down and created these impromptu arrangements, which have all the character of her living room performances. 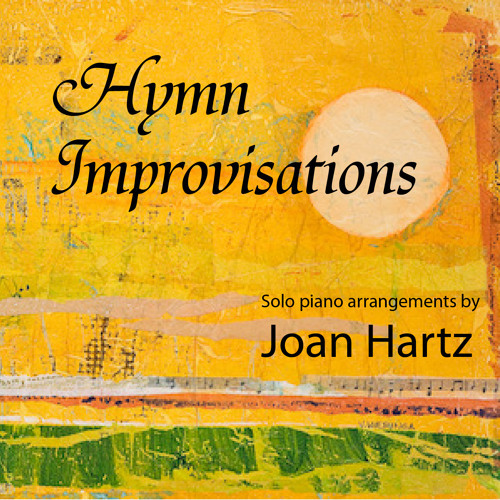 So I am pleased to publish online for the first time nine of Joan Hartz’s original piano arrangements. I’ve called the set Hymn Improvisations. Listen below, or jump over to SoundCloud, where the playlist is hosted. Unfortunately, some modification of the original recording was necessary. In seeking permission for the few songs still under copyright, I found that the two controlled by Music Services, Inc.—“My Hope Is in the Lord” and “’Til the Storm Passes By”—are too expensive to license for online streaming, so I’ve omitted those from the playlist. Other than that, I’ve preserved intact the order and content of that November recording session. Track 4, “In the Garden,” also holds special significance for Mom-Mom, it being her mother Florence Rothamel’s favorite hymn. I hope you enjoy my grandma’s online debut! A special thanks to Virginia Wieringa, who graciously allowed me to use one of her collages for the album cover art. Inspired by Psalm 5, the image expresses so well my grandma’s exuberant spirit, which I think you will agree comes across in her music. 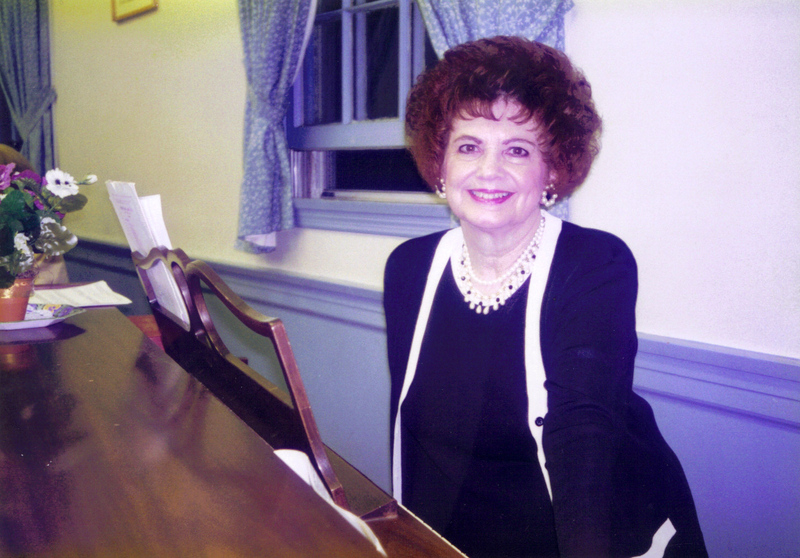 This entry was posted in Music and tagged Joan Rothamel Hartz, piano hymns. Bookmark the permalink. This is a beautiful tribute to Mom-Mom. The music is very special and reminds me of going to their house on Sundays to eat dinner after church. Thanks, Victoria, for putting this all together. You’re the best! This was such a great idea; the music is beautiful! Thank you for sharing this. I listened to your grandmother’s playing today – what a gift! And your tribute touched my heart. A wonderful grandmother and a wonderful granddaughter! Love to you both. Yes, she is very loving person. To her Church & to her Family. Into it. Her CD was amazing & wonderful!